Need it be said why the week before Christmas is chosen? Is not the festive season, when families and friends exchange gifts in memory of The Gift laid on the altar of the world for redemption of the human race, the most appropriate time to consecrate a portion from abounding riches and scant poverty to send forth the good tidings of great joy into all the earth? I wonder how many of us really believe that it is more blessed to given than to receive. A woman who accepts the statement of our Lord Jesus Christ as a fact, and not as "impracticable idealism" will make giving a principle of her life. She will lay aside sacredly not less than one-tenth of her income or her earnings as the Lord’s money, which she would no more dare touch for personal use than she would steal. How many there are among our women, alas, who imagine that because "Jesus paid it all," they need pay nothing, forgetting that the prime object of their salvation was that they should follow in the footsteps of Jesus Christ! 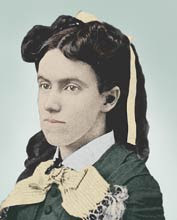 After Moon’s death, the annual missions offering was named the "Lottie Moon Christmas Offering" in her memory. We join again this year in supporting this annual offering to further cross-cultural missions among the nations. Note: Evangel article on December 4, 2008.